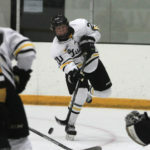 The Gustavus men’s hockey team lost to UW-Stout 4-1 on Saturday night, dropping to 2-3-1 on the season. 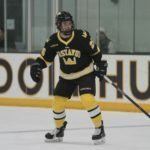 The Gustavus men’s hockey team opened the MIAC season Friday night at Don Roberts Ice Rink and played to a 3-3 double overtime tie against St. Olaf. 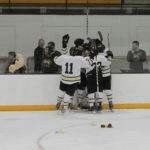 The Oles were able to pick up the extra point with a shootout victory. Both teams move to 1-1-1 overall and 0-0-1 in the MIAC. 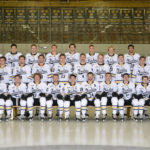 Youthful experience may best describe the Gustavus men’s hockey team as it enters the 2018-19 season. One season removed from an unexpected run to the MIAC playoff championship game, the Gusties return eight of their top-10 scorers from last year, including a pair of All-Conference goaltenders. Colton Schmidt (So., Eden Prairie, Minn.) scored 2:38 into the overtime period, leading the No. 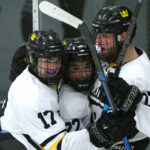 4 seed Gustavus men's hockey team to a 4-3 victory over the No. 1 seed University of St. Thomas Saturday evening to advance to the Minnesota Intercollegiate Athletic Conference Playoff Championship game. 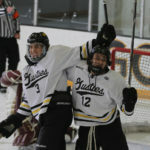 Colton Schmidt's (So., Eden Prairie, Minn.) game-winner at 16:37 of the third period lifted the Gustavus men's hockey team to a 2-1 victory over Concordia College Thursday evening during a Minnesota Intercollegiate Athletic Conference Playoff Quarterfinal matchup at Don Roberts Ice Rink. 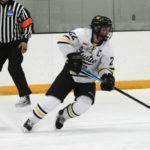 The Gustavus men's hockey team took a 2-0 lead and held on late, adding two empty net goals to defeat the No. 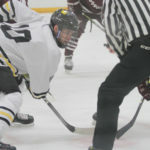 14-ranked Augsburg University by a score of 4-1 Friday evening at Don Roberts Ice Rink. The Gustavus men's hockey team earned its first shutout win of the season, defeating Bethel University 3-0 during the second annual Gustavus Hill Crew Teddy Bear Toss Benefit at Don Roberts Ice Rink Friday evening.